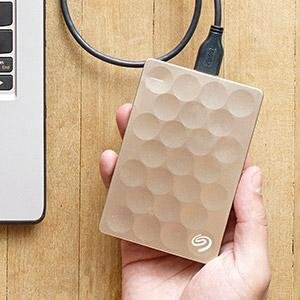 Ultra Slim is one of Seagate’s thinnest portable drives. At 9.6mm thin, capacity is not sacrificed with 1 TB and 2TB options - bring your most important files and head out the door. Available in eye-catching gold and platinum colours - style meets storage - and easily slips into your backpack along with all your other essentials. With Ultra Slim, your digital life has never had so much room to expand into. 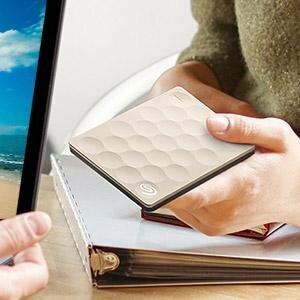 The Backup Plus Ultra Slim Portable Drive is one of Seagate’s thinnest and most eye-catching portable hard drives. Available in stunning gold and platinum colours - style meets storage - and easily slips into your backpack along with your other essentials. 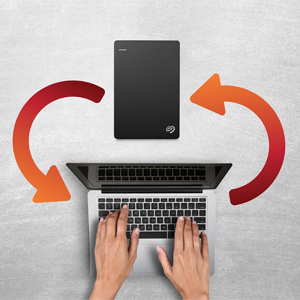 At 9.6mm thin, capacity is not sacrificed with 1TB and 2TB options - bring your most important files - and head out the door. Scale shown is not exact.